D.C. protest organizer: "This is a long haul, a long battle"
WASHINGTON (CNN) -- Iranian-Americans demonstrated on the streets of Washington on Wednesday evening, marching from Iranian diplomatic offices to the Russian embassy, in protest of both governments' actions. 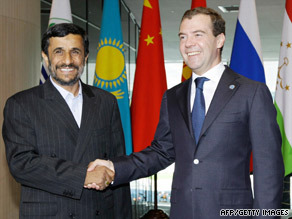 A Tuesday meeting of Mahmoud Ahmadinejad, left, and Dmitry Medvedev has angered Iranian-Americans. The demonstration came in the wake of Russian President Dmitry Medvedev hosting Iranian President Mahmoud Ahmadinejad in Moscow on Tuesday, despite allegations of ballot fraud in Ahmadinejad's re-election last week. "We're hoping that the world attention does not end from what the Iranians are doing right now, because this is not going to end in the next few days, because this is a long haul, a long battle," said Washington protest and group organizer Morteza Ahmady. "Iranians are very capable of deciding their own destiny." The group Whereismyvote.org organized the demonstration of about 100 people and aims to build support for its "global protest" this Saturday. "I think it's a very new thing from a historical point of view; it's a civic movement. People try to keep it as nonviolent and civil as possible," said group organizer Negar Mortarzavi. In Russia, Ahmadinejad was welcomed as the "newly re-elected president of Iran," with Deputy Foreign Minister Sergei Ryabkov telling reporters, "the issue of elections in Iran is an internal affair of the Iranian people." Eighty-five percent of the country's 46 million eligible voters went to the polls on Friday, an unprecedented turnout, Iran's interior ministry said. When the ballots were counted, the government declared Ahmadinejad the winner, with 62.63 percent of the vote. The man many analysts had widely expected to win, Mir Hossein Moussavi, received 33.75 percent. The speed with which the election results were released -- two hours after polls closed -- insulted the Iranian people, said Ahmady, who cited that as a sign of fraud. Moussavi's camp has demanded new elections. Sarah, a Washington protester who would give only her first name, agreed. "We're not saying that pro-Ahmadinejad supporters don't exist; they do exist," she said. "And we're saying that, yes, if they indeed did win the vote, then the election should be theirs, because we are a democratic people. But we don't feel comfortable with the numbers that came out of Iran. And we're not saying that we don't accept it altogether. We're just asking for a revote."